Fresh peas are like sweetcorn – sugars start turning to starch as soon as they are picked, so the taste difference between freshly picked and shop-bought is massive. I’ve never grown enough peas to really warrant doing anything with them bar snack around the plot. Mildew, slugs, pea moth, general neglect – they’ve all played their parts in kyboshing my pea aspirations over the last 4 years. This year’s combination of near-incessant rain and fairly steady coolish temperatures have changed all that. 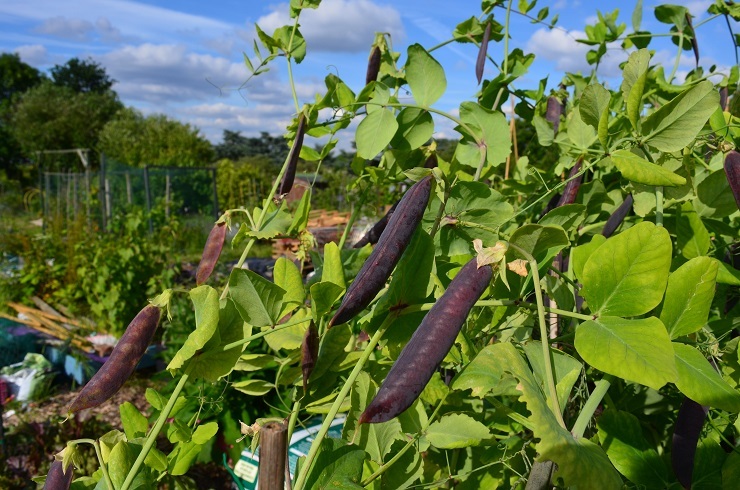 The purple peas are so easy to spot on plants which are now topping 6ft and listing drunkenly. Last night’s delight was peas and tomatoes sautéed briefly in peppery butter before being stirred into pasta. Quick and tasty. There are masses left and none have had caterpillars in so far! Yacon. The one small tuber I bought at Seedy Sunday has turned into an absolute monster of a plant. I need to shift the tub into a roomier position. I love the fuzzy leaves and the fact that it shrugs off snail/slug attacks without a care in the world. Wild garlic has pretty much disappeared for now. It flowered profusely in the hedge and on the balcony, which I hope means that it is going to spread a lot more. I am bagging seedheads on the balcony to catch seeds before they are blown to the four winds. 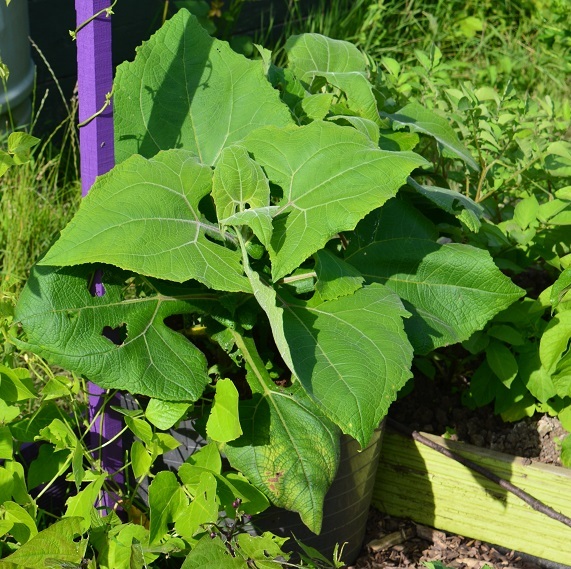 Giant achocha and kiwano seedlings are turning into vigorous, sturdy plants – they are just still in pots because where they are going to be planted has only recently stopped being totally waterlogged from last week’s storm. The disappointingly spindly Szechuan pepper twig, which arrived with Mum’s cherry tree, has sprouted elegant leaves and looks really rather enticing now, though the thorns demand respect. The leaves are spicy when rubbed between your fingers. It’s staying in a pot for this year and then will get a more permanent home on #100. At some point this year I might even remember to take a picture. The pepino in the greenhouse is starting to grow – they aren’t the fastest plants on the planet, are they? 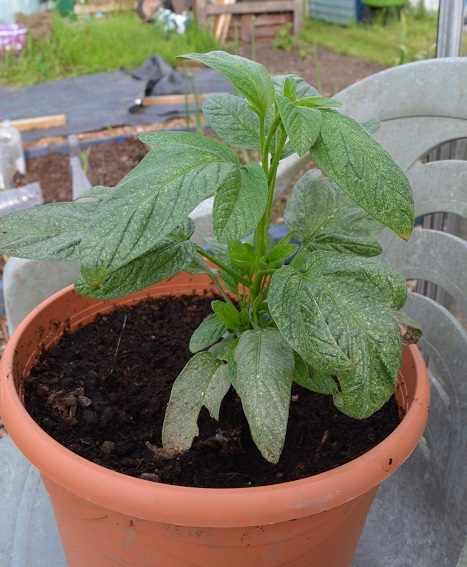 All the chillies have overtaken them and are about to burst into flower if they haven’t already. My Italian pomegranate will be 3 years’ old this year. 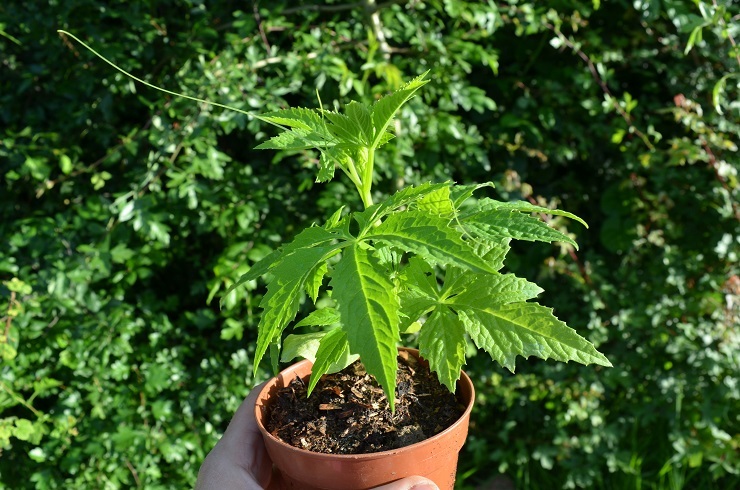 It has a new home with decent compost and is growing away furiously, now reaching the giddy height of about 45cm. I doubt it will flower this year (ever? ), but it gets plot space just for being pretty. It came as the tiniest of seedlings in Paolo’s garden and I have no clue as to how old it needs to be before it’s mature enough to do something productive. Another will be joining it in summer from the same garden in Rimini, in case flowers happen and it needs a friend to hold its hand through the trials of pollination. 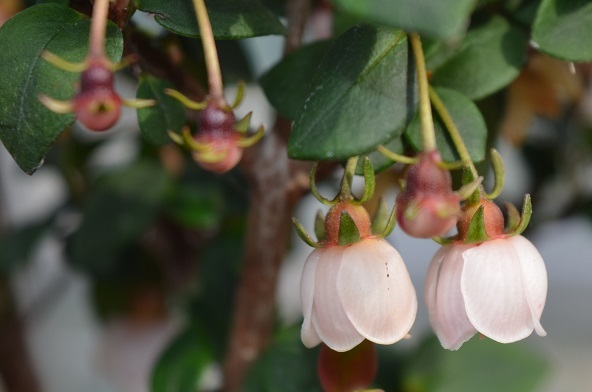 Last year’s Chilean guava purchase still looks very scraggy indeed, but it is absolutely covered in tight pink buds that develop into the most beautiful, delicate, bell-shaped flowers. At this point last year they all fell off and I was left with a small, untidy, green shrubling. This year I am hoping for Great Things. I found a Gypsy Moth caterpillar on the pot though, so fingers crossed they don’t find these tasty. This makes up for the fact that slugs are eating anything bean-shaped, my chufa didn’t germinate, stevia seedlings were hoovered by a rare balcony-climbing slug and out of a packet of lemongrass seeds I have just one wispy seedling. I’m glad you’ve finally got a good harvest of peas. Mine are coming too now and I wouldn’t be without them. Summer in a pod! It IS very satisfying – though I think I like sugar snaps a little more. The Magnolia Blossom Tendril Peas are incredible. My experience with peas has been the same as yours – in the past I was always disappointed, but they are doing well this year. I’m ahead of you with the Lemongrass though, because I think ALL the seeds I sowed germinated and I now have about 30 little plants! Glad I’m not the only one. 🙂 I think I might try another packet of lemongrass seeds and see what happens. Nil desperandum!